Te Wāhipounamu, the greenstone waters, is a sacred place in the Maori culture of New Zealand. The foreboding mountains and steep-walled valleys on New Zealand’s southwest coast are the places of Atua, gods. And the streams that wash down from the glacier-capped peaks carry a highly prized stone, a hard, translucent, green rock that the Maori carved into jewelry and blades, for both tools and weapons. The rock, greenstone, came to New Zealand when Ngahue fled a jealous chieftainess on Hawaiki, taking Poutini (his greenstone) with him. His canoe brought him to the South Island of New Zealand, where he secreted the stone in the mountains of the southwest coast, says Maori legend. Poutini remains hidden, but pieces break off in streams, providing the Maori with precious greenstone. Most New Zealand greenstone is nephrite—a form of jade—though some is bowenite, another mineral. From space, the west coast of New Zealand resembles the greenstone for which it is named. Dark green native forest extends from the mountain tree line to the shore. Southern beech, rimu and kahikatea (both tall conifers) once covered more than 80 percent of New Zealand, but the lowland forests are now less extensive. The lighter green land in the southeast was once forested, but is now grassland or agriculture. The remaining forest is as precious as the greenstone it resembles. It is an echo of the ancient forests that once spread across the great southern continent, Gondwana, more than 100 million years ago. Some giant trees in today’s forest are as much as 800 years old. The forest is invaluable, too, because it harbors unique and endangered animals like the kiwi and takahe, both flightless birds, and the kea, the only alpine parrot. Te Wāhipounamu is wilderness, and New Zealand has set the land aside to conserve it. The entire 2.6 million hectares that make up the southwest coast of the South Island (about 10 percent of New Zealand’s land area) is divided between four national parks, state forests, and other conservation areas. Its natural and cultural significance made Te Wāhipounamu a World Heritage area in December 1990. 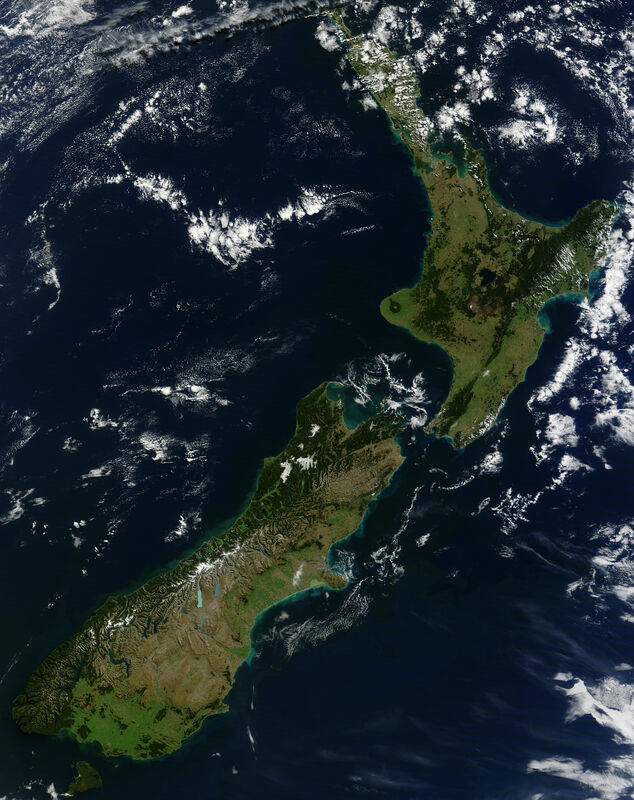 The Moderate Resolution Imaging Spectroradiometer (MODIS) on NASA’s Terra satellite captured this unusually cloud-free view of New Zealand on April 9, 2010. 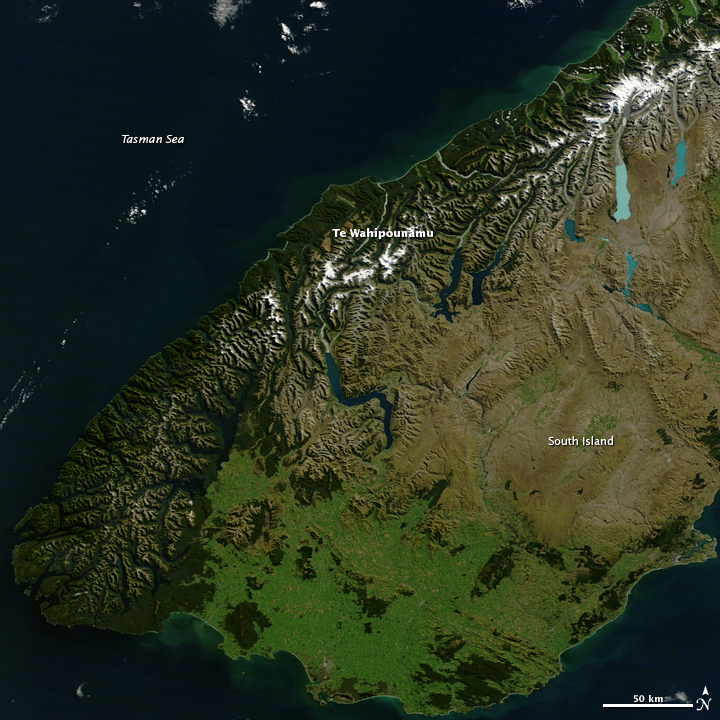 The large image shows both the entire South Island and the North Island at the sensor’s maximum resolution. The image is available in additional resolutions from the MODIS Rapid Response Team. 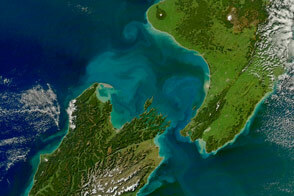 From space, the southwest coast of New Zealand resembles the greenstone for which it is named. This cloud-free satellite image is from April 9, 2010. Department of Conservation. TeWāhipounamu – South West New Zealand World Heritage Area. Government of New Zealand. Accessed May 3, 2010. Department of Conservation. (2007, May). TeWāhipounamu – South West New Zealand World Heritage Area (pdf). Government of New Zealand. Accessed May 3, 2010. De Wit, M., Jeffrey, M., Bergh, H., and Nicolaysen, L. (1999). Gondwana reconstruction and dispersion. University of Witwatersrand. Accessed May 3, 2010. Keane, B. (2009, March 2). Pounamu – several names. Te Ara, the Encyclopedia of New Zealand. Accessed May 3, 2010. Reed, J.J. (2009, April 22). Greenstone. An Encyclopedia of New Zealand 1966. Accessed May 3, 2010. Swarbrick, N. (2009, March 2). Forest in 1000 and 1840. Te Ara, the Encyclopedia of New Zealand. Accessed May 3, 2010. Wassilieff, M (2009, March 1). Rimu and kahikatea. Te Ara, the Encyclopedia of New Zealand. Accessed May 3, 2010. World Heritage. (2010, May 3). Te Wahipounamu – South West New Zealand. United Nations Educational, Scientific and Cultural Organization. Accessed May 3, 2010.